Traded to the Padres mid-season in 1993, Archi Cianfrocco started off in a slump. He then heated up, The Associated Press wrote. After going 2 for 30, Cianfrocco then went 57 for 186, a .306 average, The AP wrote in mid-September. "Once I started getting hits, things began to take their place," Cianfrocco told The AP after helping his Padres to a late-season win with a double. "You get a little bit of confidence and you start feeling comfortable." Cianfrocco went on to keep that confidence over five more major league seasons, all with the Padres. Over seven total seasons in the bigs, that confidence resulted in Cianfrocco seeing time in 500 major league games, hitting 34 home runs and knocking in 185 total runs. Cianfrocco's career began in 1987, taken by the Expos in the fifth round of the draft out of Purdue University. He went to Purdue out of Onondaga Community College in Syracuse and Rome Free Academy in his native Rome, NY. Cianfrocco started at short-season Jamestown, hitting .247 in 70 games. He made AA Jacksonville in 1989, staying at that level for three seasons. In 1992, Cianfrocco made the jump to the majors and Montreal. 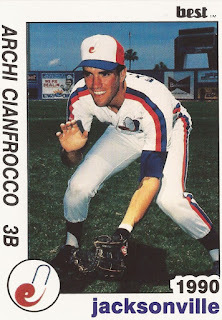 Cianfrocco played in 86 games for the Expos that year, hitting .241, with six home runs. He got into another 12 games there in 1993, before being traded to the Padres for Tim Scott. With the Padres, Cianfrocco ended with a .244 average over 84 games. He also hit 11 home runs and picked up 47 RBIs. Cianfrocco returned to the Padres to play in 59 games in 1994 and 51 in 1995. In 1996, he got into 79 games and hit .281. In August 1996, Cianfrocco helped extend the Padres lead in the division with an extra-inning, pinch-hit single. "It seems like I was hitting the ball well (pinch-hitting), I just wasn't getting any hits," Cianfrocco told The AP after going 1 for 19 pinch-hitting. "Tonight I hit the ball off the end, soft, and it kind of fell in." Cianfrocco continued with the Padres into 1998, playing his final game that September. For 1999, he had a brief stint in Japan with Seibu, ending his career. In 2012, Cianfrocco was director of sales at Xyratex, a data storage technology firm. He was also watching his son play at Perdue, according to The Utica Observer-Dispatch. Cianfrocco told The Observer-Dispatch that June about his decision to leave the game for the business world. "The Padres wanted me to coach in the minors, or scout, but those positions in many cases are less stable than that of a player," Cianfrocco told The Observer-Dispatch. "I really wanted to try something different. Now, I work out of my home and I get to see my kids much more."